The Visual Composer users have found themselves quite confused lately, and we are here to clear the things up. You have probably seen two new names in our offer; WPBakery and Visual Composer Website Builder. If you think WP Bakery is a new product while the Visual Composer Website Builder is just a new name for the old Visual Composer Page Builder – unfortunately, you are wrong. We admit that the whole thing is quite confusing and we understand why so many of our users, as well as long-term partners, are upset about this change. Which brings us to the reason we decided to publish this post in the first place. Above all, we want to apologize for the confusion around Visual Composer, and we want to explain what happened here. We are sorry for the mess we have created around Visual Composer. We realize that we should have explained what caused this situation from the very beginning before it escalated. Unfortunately, we underestimated the situation and didn't follow through the right steps at the right time. We hope to make up for it right now. So let’s finally dive deeper into the mind-twisting story behind this name change – and why it got even worse as we tried to fix it along the way. On every major WP theme, you have probably noticed the name above. After all, it was included as a premium plugin in the majority of the all-time favorite WordPress themes. So the big question is: Why would we change the name in the first place when it was so well-known and easily recognizable? The truth is – because we had to; we did not have a choice. If you want the whole story, check out the video below. It all began with our new product, the Visual Composer Website Builder. It is worth mentioning that the Visual Composer Page Builder and the Visual Composer Website Builder are two entirely different products used for different purposes. The Page Builder is an Envato-exclusive product with a lifetime license (like all products sold with Envato). The Website Builder, on the other hand, was meant to move away from the lifetime license model. We wanted to create a product much more complex in features and specially designed for the users whose building needs have rapidly evolved. However, the new features came hand in hand with much higher development costs, which could only be sustained with a yearly license model. In addition to that, we wanted to be in direct touch with our users because we recognized the need for the best support we could possibly provide. And that detail in question was the contract we signed with the marketplace and all its limitations. Long story short, we were not allowed to sell another product under the name of “Visual Composer” outside their platform. 1. We could strip features off our new product our new product to fit the lifetime license model and put it up on the marketplace. 2. We could change the name of our Page Builder, the one we were already selling on the platform to lift the contractual limitations. It was not an easy choice to make, and we knew that both options had significant downsides. We weighed our two options over and over again, and eventually, we decided to go with option 2: change the name of Visual Composer Page Builder. We decided not to compromise the quality of our new product, and this was the only way to do it. This is where the whole confusion started. Not only were we buried in the process of developing our new product, but we also had to deal with a whole new set of unplanned changes. Dealing with all that work, we did not immediately notice the vast confusion we created. Not only were people confused about the name change, but they didn’t understand what the deal was with our new product, Visual Composer Website Builder. Was it a new product or just a rebranding of the old one? And what about WP Bakery? Is this a 2.0? Is this a new plugin altogether? So let’s take it step by step and explain the difference between the two once and for all. The Visual Composer Website Builder is a live-preview editor with drag-and-drop features. It is not the same thing as the Visual Composer Page Builder. It is an entirely new tool. It comes in two versions; the free and the Premium version. There are hundreds of ready-to-use content elements to choose from that will help you turn your ideas and visions into reality. It is easy to use thanks to the drag-and-drop features, and you can see all the changes instantly. It can be used with any theme, including your existing themes. On top of that, you can choose from a variety of WP templates for different types of pages (landing pages, portfolios, corporate websites, product pages and many more). Page editing works in two ways; frontend editor and tree view. With the tree view, you can navigate through the elements available on the page which will save you a lot of time during the process. Are Visual Composer Website Builder and WP Bakery the same thing? Short answer: No. These are two entirely different plugins. Let’s take a moment to explain the main differences between the two. Some people believe that the Visual Composer Website Builder is merely a premium version of the WP Bakery. It is not. Visual Composer Website Builder’s code was built from zero with React.Js. It does not use any of the WordPress shortcodes. It was developed using the feedback from our users to offer them the best experience possible. However, the most significant difference between the two products is that WP Bakery is only for the content part, while Visual Composer Website Builder allows you to build a complete website (with Headers and Footers). Like mentioned before, Visual Composer Website Builder does not use any shortcodes, while WP Bakery is shortcode-based. 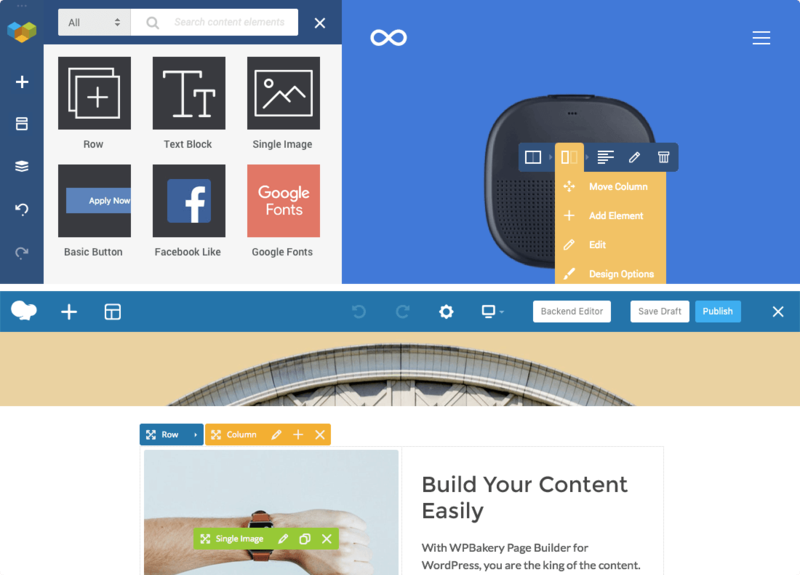 On top of that, VC Website Builder comes with a cloud-based Hub from which you can download all the elements you find useful. Basically, you can handpick the elements you need and download only them rather than bloating the website with a bunch of unnecessary assets. There’s a full list of difference between the two products that you can check right here. That being said, we also have to point out that WP Bakery is still getting the same amount of work and attention as it did before we developed VC Website Builder. Both of the products are equally important to us, and we want to offer the best user experience possible. Thank you for taking a moment to go through this story with us. If you have any additional questions regarding our products, please leave a comment, and we will try to give you the answer as soon as possible. Thanks for the post and explanation, it has been confusing. 1. If you were to start a new website for a client or yourself would you do it with Visual Composer Website Builder or WP Bakery? 2. Would the choice change if you were working with a popular theme like Betheme? 3. Is one of the products going to be more future proof? 4. Does the use of no short codes mean that if the Visual Composer outputs real html to the editor and the page will still display when the plugin is deactivated? 1. Definitely Visual Composer Website Builder. It’s a modern application with a focus on performance and user experience. 2. It depends on the themes. If a theme is adding a lot of elements for WPBakery Page Builder then you won’t be able to use it within the Website Builder. If you don’t need myriad of extra features that theme adds then you can use Visual Composer Website Builder and choose from the available elements within the Hub. 3. Visual Composer Website Builder is the future. It basically is the new take on the drag and drop experience with all the experience that we have. 4. Yes, it outputs html and disabling the plugin will not remove your content completely. Yet, (as you can imagine) css is still needed to style them properly. For that purposes, we have created a CoSSa plugin. A really simple plugin that will simply load css/js files. Thank you for clearing up the situation. I have a quick question. My favorite thing about visual composer was the Back End Builder. And we bought the product not realizing that on January 2019 you made a post saying that the back-end editor will be gone. We’re eagerly awaiting some updates on this occurrence, or testing out the structured view that is meant to improve the old back end editor. Any chance you can tell me when these features will be added back again? It is on our to-do list but it isn’t scheduled. We truly believe that real fronend experience is the best thing and our main focus will be there. We will introduce structured view but it will take us “some time” to get there. 3. Start the new product under a new name with a fresh start promoting React. Thanks, Max. Yes, indeed, there was an option to start with a new brand. At the same time, we were thinking of migration tool from the WPBakery Page Builder to the Visual Composer Website Builder at some point. We still have this idea but are facing some tough technical issues – mainly due to the number of add-ons and third-party changes. Will see how it works out, but I guess we just need to work hard on making Visual Composer Website Builder better and better and help people to understand the difference. Basically to summerise you guys got greedy and wanted to switch to yearly subscriptions and then tried to fudge and avoid your contractual obligations by utilization of a loophole in the existing contract. But in your greed you forgot the most important factor – CUSTOMERS! You have a new product that you claim has Header, Footer and sidebar editor, but fail to mention the bait-and-switch – IT’S ONLY AVAILABLE IN PREMIUM! FFS, you are so greedy you don’t understand the freemium model at all! Why call the new product Visual Composer at all, if it’s not Visual Composer? Just call it something else.. Thanks for the question. We wanted to develop our brand together with the new product. We are sorry that legal question got on the way and we do everything we can to let our users know about the change. I’m glad that now you are one of them. Have a great day. It’s been confusing for sure. The thing I’m really missing is a way to see the elements of Premium in action. I think you guys are missing out here. Right now I can only read about this. I would think a preview site where you showcase this would a lot better as a customer and for your sales. This is one of the great things with the envato sites like codecanyon. Even I who have VC Premium would appreciate this. Then I could check out the new elements like a user without having to create a test site and do “all the work”. Thank you, Zach, for the “to the point” feedback. Of course, it’s planned and I miss that option too.